Our species isn’t all that special- according to evolutionists after further evidence of Neandertal fire-making abilities were reported in a study by Scientific Reports. Yes, those half-witted, scruffy-looking, club-dragging brutes were actually making fire more than 50,000 years ago according to Discover.com, and this somehow proves we’re not as exceptional as we think. That’s an interesting take on human history, but is to be expected from evolutionists who believe all life evolved from a single, common ancestor, and that there’s nothing special about humans. If other species are capable of making fire, then what’s the big deal? We’re no better than them… or any other animal, for that matter. These types of claims are meant to challenge religious beliefs that we’re created special. According to Christianity, for example, man was created in the image of God and given dominion over the Earth and the animals. But if we evolved by natural processes, then that can’t be true. To make their case, the author sites a study suggesting that ‘Neandertals were just as capable of producing fire’ as our evolutionary ancestors were. Neandertals, they suspect, may have used a powdery manganese oxide, adding it to their tinder and striking a hand axe against it, producing sparks to light a fire. But does Neandertal fire-making ability really mean we’re not so exceptional? Could there be alternative interpretations that support our exceptionalism? The author desperately wants us to think that Neandertals are not human, belonged to a different species, and that many different species of hominins lived, evolved and went extinct, leaving us as the sole survivor. However, there’s a wealth of evidence suggesting that all the different people groups- including Neandertals- belong to the same species: the human species. And that humans are indeed special and exceptional. Genetic studies have demonstrated there’s little difference between Neandertals and people from any other people group or race. In fact, we know Neandertals interbred with other humans because modern humans contain Neandertal DNA. 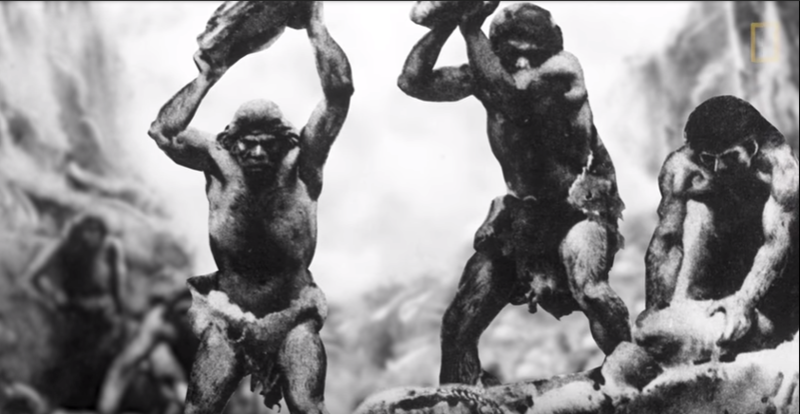 All ancient humans had the cognitive ability to produce fire, bury their dead, make advanced tools, produce art, and were just as capable as we are. There’s nothing inferior about their brainpower compared to us. Now, despite my criticism of the author’s evolutionary beliefs, I do agree that modern humans are no more special than Neandertal- or any other human ancestors. But that’s because we all belong to the same human species and have not evolved from any ape-like animal. I believe God did create humans in his image, and that they were intelligent from the very beginning- building cities and civilizations as soon as they began populating. So, of course they were capable of building fire; the earliest humans were using technology far advanced of fire from the beginning. The real issue is the evolutionary belief that we’re a separate species from other ancient people groups, and that such a belief somehow proves we’re not special and couldn’t have been created in the image of God. Humans didn’t evolve from anything else, and we’re not in the process of evolving into something else. All the different races and nationalities we see today are part of the same human species as Neandertal, Homo erectus, Homo floresiensis and all the other extinct people groups because we’re all descendants the same parents- Adam and Eve; therefore, one race is not less human than another, nor is one group superior to another. All the differences we see are superficial, minor genetic variations; skin color, for example, is determined by the amount of melanin in our skin. More melanin will produce darker skin, while less melanin produces lighter skin. Not only are we truly exceptional when compared to all the different kinds of animals, but so were Neandertals.